I remember visiting Blists Hill Victorian Town as a child so was thrilled to return with my own children. I still reminisce having fond memories of the school trip I took there about twenty years ago. Blimey where did the time go! It was as wonderful as I remembered though. It is such a lovely opportunity walking through a Victorian town and seeing life as it was over 100 years ago. The sheer of amount of effort put into creating an authentic encounter was very impressive. The characters were all in appropriate costume, shopkeepers all knowledgeable about the occurrences back in those times and a very traditional layout of shops and work places. On arrival you can change your money at the bank to appropriate coinage for Victorian times. The bank cashier was extremely helpful and explained to my boys all about the value of money over the ages. Including the use of shells and even bark going way back! Conveniently you can still use your own money if you run out. There are so many interesting things to discover (and buy) you might find out you don’t need to. The boys made a beeline to the traditional sweet shop. They seem to have an inbuilt tracking device that can locate sweets from miles away! I on the other hand made a point of visiting the bakers. The freshly baked fruit bun we bought was delicious. It smelt lovely in there. We also made a point of having traditional fish and chips, these were were a real treat! I think I will find it hard going back to my normal fish and chip shop after having sampled these. There is plenty of fresh air to be had here, we sat by the canal to enjoy our chips. Just watch out for the ducks keen to pinch some of your lunch! Although the boys enjoyed encouraging them. We later had a big walk to burn off our chip lunch and the boys had lots of fun in the sunshine. With 52 acres to explore you can certainly tire your children out! Here is my eldest playing with his close friend from 92three30. I will say this about the attraction it is highly educational. But in a way that really catches your child’s attention. It is not just a lot of facts thrown at them but a chance to be immersed in the culture and ways of Victorian daily life. My boys had a photo opportunity with the friendly policeman who then encouraged us to join in the daily poetry session in the post office. Listening to him tell everyone “steady as you go” as he set off again was one of my highlights! I think a little bit later he doubled as a clergyman but he totally threw himself into his characters. As it was the Easter holidays there were some additional activities, my boys decorated candles (for a small additional charge), which they thoroughly enjoyed. I think it’s a welcome change from some attractions as they get to try out new and interesting things they had never experienced before and embrace a different way of life. They also enjoyed the fair, another seasonal attraction. The store holders were very kind, offering positive encouragement to try and get them to win the games and even a step up so they can reach them! At £1 a game they seem fairly priced because each time you get a pack of sweets for your efforts anyway! This helped keep the children happy even if they did not enjoy the main prize line up. We spent almost 5 hours here and could have easily stayed longer, but we had to head off to Tea with the Easter Bunny. Next time we will have to try a ride in the horse and cart and dress up in Victorian costume. There really is so much to do here and the attraction is so reasonably priced. 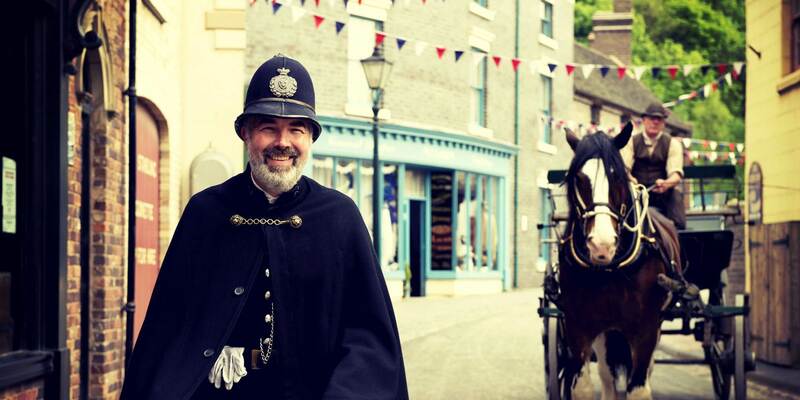 Blists Hill Victorian Town is one of 10 Ironbridge based attractions, for £68 a family of two adults and two children can have unlimited access to ALL 10 sites for one year!